Emily Sandagata makes tattered, stitched, drowned, buried, bound, pieced together paintings and sculptures. 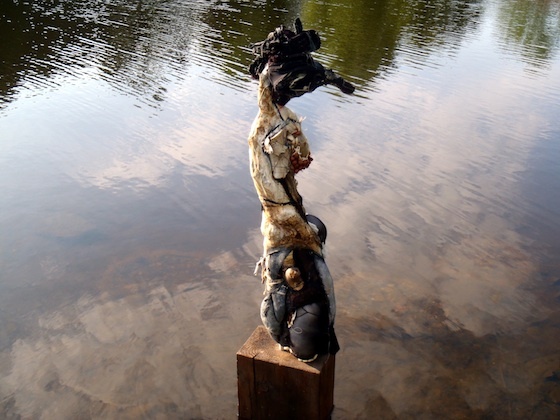 Through a multi-layered process, she creates work with reclaimed objects, natural materials, paint, foodstuffs and textiles, constructing new life for scraps of material and forgotten objects. Her work explores themes of transformation, survival, death, growth and decay. Born in northern Worcester County, Massachusetts, Emily Sandagata graduated from University of Massachusetts, Dartmouth with a BFA in Textile Design/Fiber Arts. She holds a Masters of Art in Art Education from the Maryland Institute College of Art and has worked as an art educator in New York, Arizona and Massachusetts. Since 2009, she has shown her work throughout Massachusetts, including the 2011 and 2013 Massachusetts Artist Biennial, and Tales from a Test Tube, a 4-person show at the Warner Babcock Institute in Wilmington, MA. She has received numerous awards and achievements, including First Prize in the Fitchburg Art Museum’s 76th Regional Exhibition in 2011, and a Material Needs Grant from ArtsWorcester in 2013.